Chris Dodd had some thoughts on Boat Race Day. 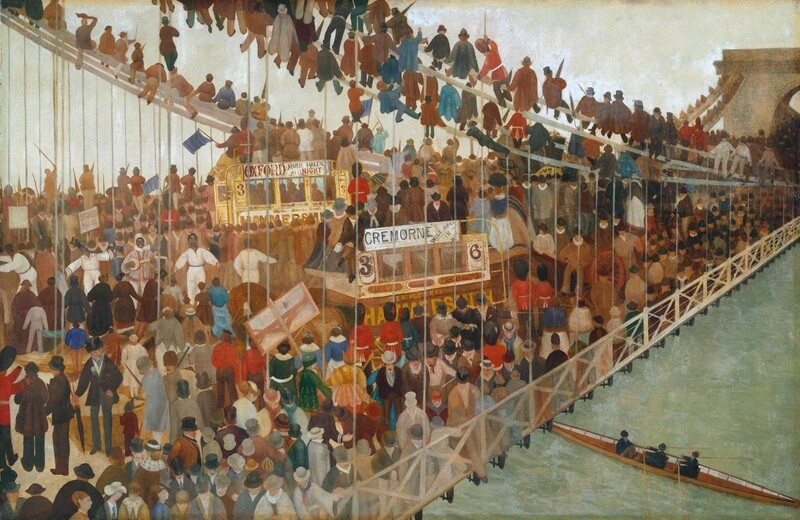 Hammersmith Bridge on Boat Race Day c.1862 by Walter Greaves, the son of a Thames waterman and a self-taught painter. 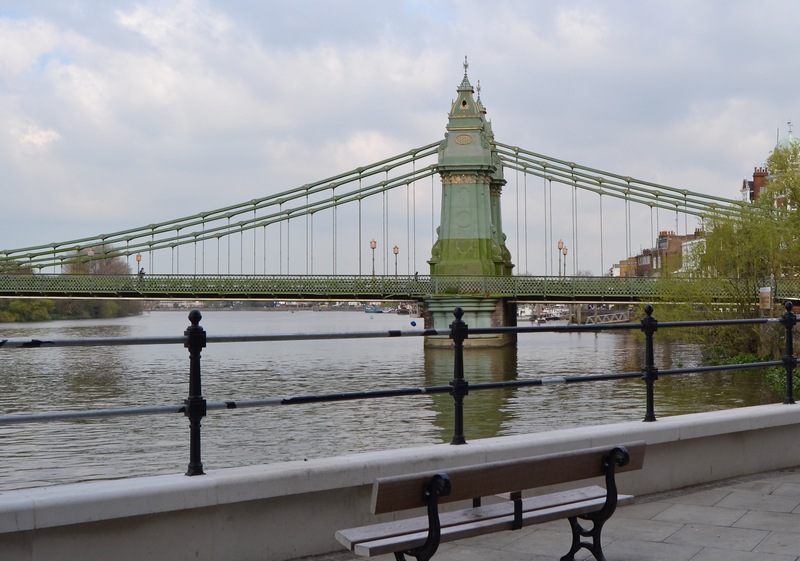 During the 1870 Boat Race, 12,000 people gathered on this, the first Hammersmith Bridge (1827 – 1884). Even in those times, this gave rise to fears over the structure’s ability to support such weight. The latest news from Putney-to-Mortlake is that its most elegant bridge, and my favourite on the Tideway, Hammersmith, is suddenly closed to traffic because it is falling down. Hammersmith and Fulham Council says it has run out of money to maintain it and blames Transport for London for neglect and a Government bent on austerity, brexiting Europe to enter an era of political and economic wilderness, and showing mean spirit to senior citizens such as Hammersmith Bridge, born 1827. The real thing. 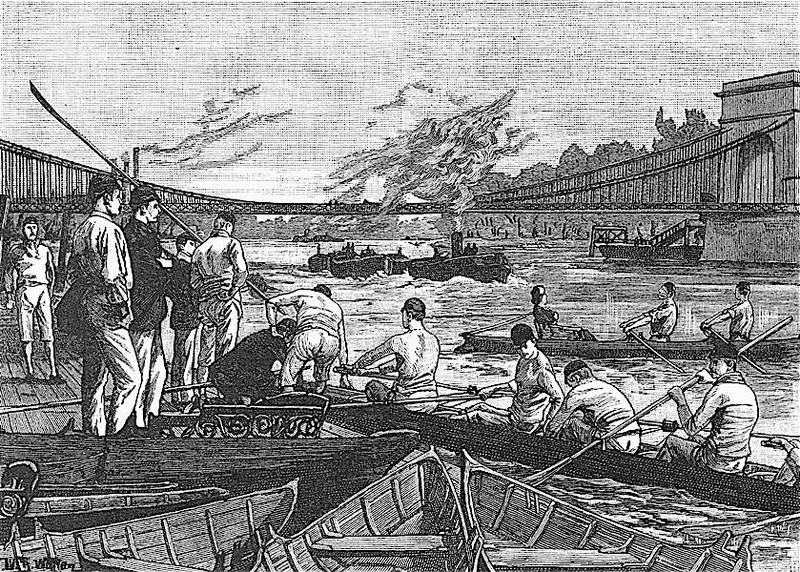 Hammersmith Bridge on a Boat Race Day in the 1870s, looking upstream on the Middlesex side. The same view today. This is the second and current bridge, opened in 1887 (though, arguably, a temporary bridge of 1884 to 1887 was number two). The original bridge linking Hammersmith and Barnes to a design by William Tierney Clark was the first suspension bridge over the Thames. 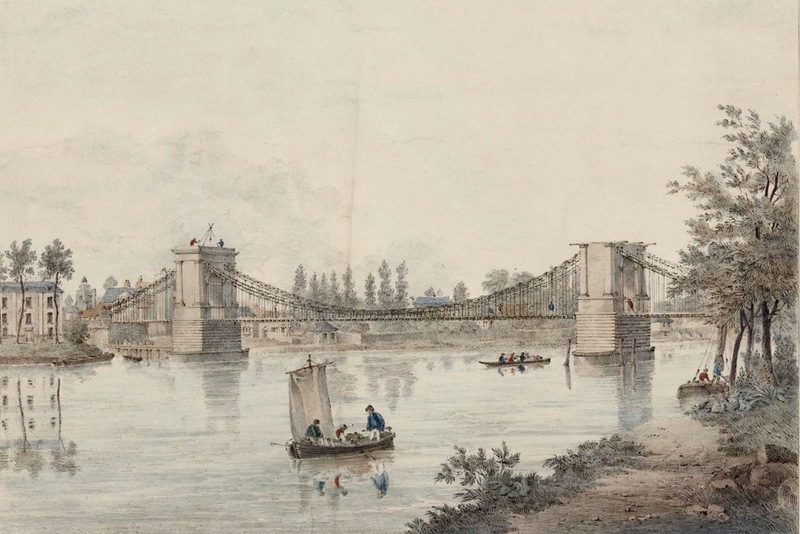 Clark also designed Marlow Bridge, which opened in 1832 and was the model for the Chain Bridge linking Buda with Pest, the first bridge across the Danube. The idea of joining up Budapest came to Count Istvan Széchenyi when rowing at Hammersmith with Lord Jersey in the 1820s. He witnessed the bridge going up and, who knows, might have passed under a lamppost lighting his thoughts with the best of the tide. At any rate, he hired Clark to build his chain bridge, modelled more on Marlow than Hammersmith, and set up Hungary’s first rowing club for the English and Hungarian workforce to compete against Italian military types. 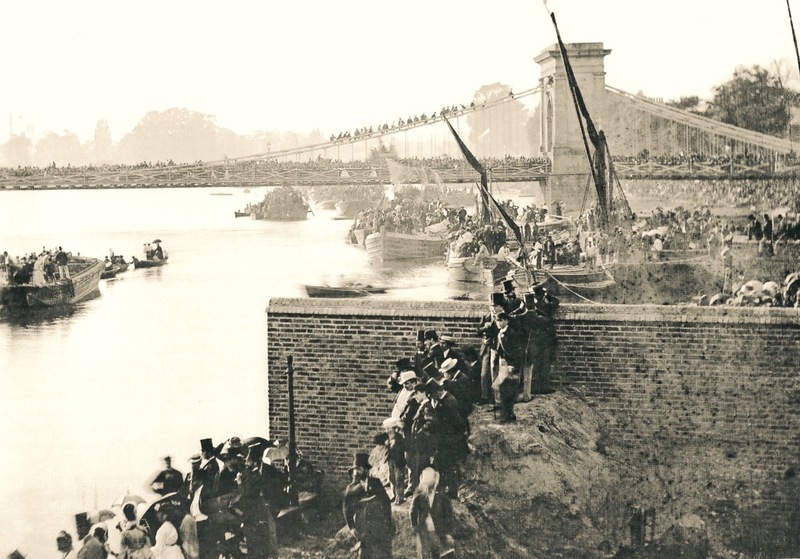 The first Hammersmith Bridge nearing the end of its construction in July 1827. 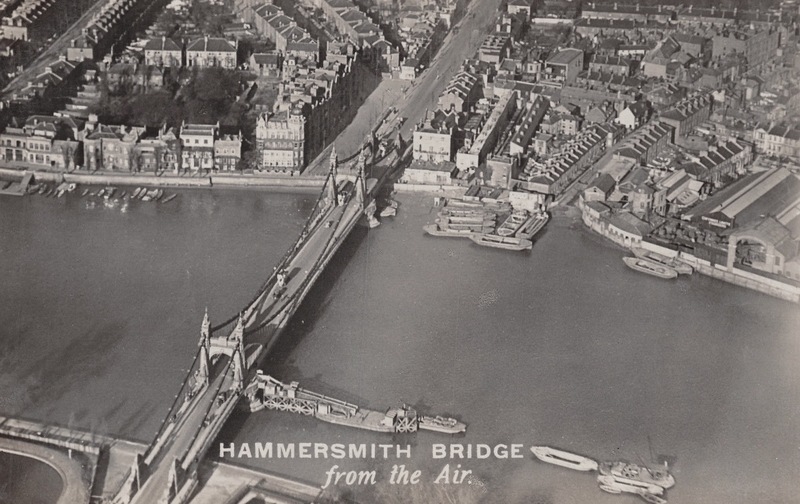 The second and current Hammersmith Bridge from the air in the 1930s. The present, ailing Hammersmith suspension was designed by Sir Joseph ‘Supersewer’ Bazalgette in 1887, using Clark’s original pier foundations. This is not the first time that Bazalgette’s bridge has closed for works, by any means. Apart from inherent structural weakness, it has been weighed down by thousands of fans watching the progress of Blues on a crucial bend about a third of the way to the finish, bashed by lorries and barges, and thrice bombed by the IRA. But there may be an upside to the present cash crisis. Hammersmith’s crossing will be limited to walkers, joggers, dreamers and the occasional bus. Boating Men and the first Hammersmith Bridge, c.1880. 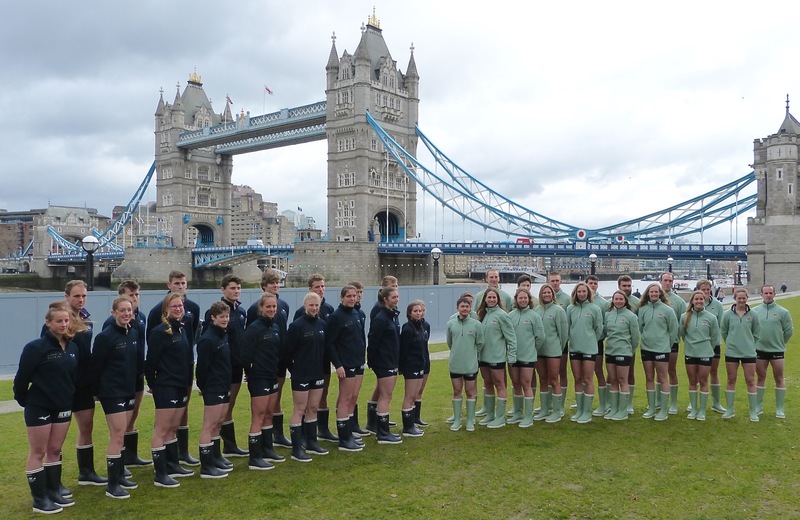 Boating Women and the second Hammersmith Bridge, the 2016 Women’s Boat Race. Incidentally, Baza is in the news because pressure on his superbly constructed but no longer adequate sewers is being relieved, if that’s the word, by new bores under the Thames. One access point is by the stone that marks the start of the Boat Race where a huge sunken shaft remodels the embankment near Putney Pier. The spokesman for the Thames Tunnel, and its ambition to bring more life to the river, is Andy Triggs Hodge, triple Olympic gold medallist and Oxford Blue. 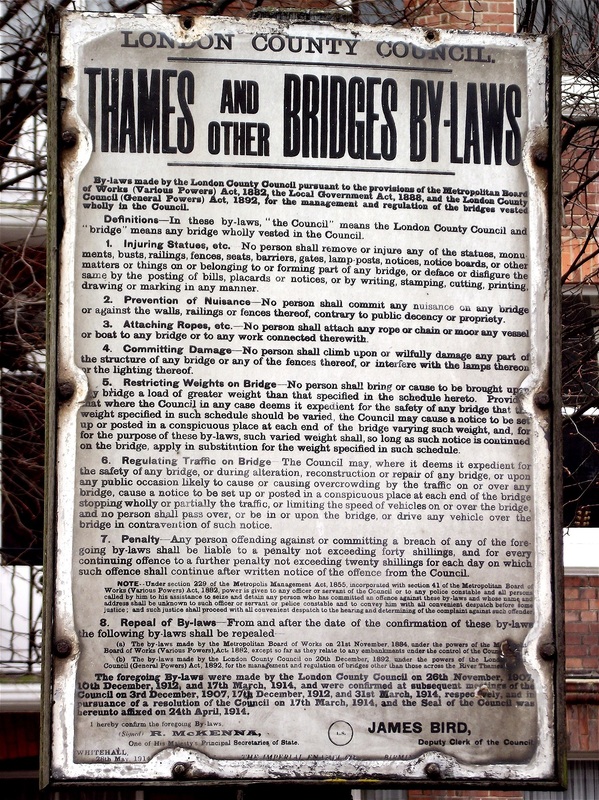 A sign from 1914 that stood on the Middlesex side of the bridge until very recently. As rules 5 and 6 show, fears of heavy vehicles using it are not new. The signatory at the bottom, R. McKenna, won at Henley twice with Trinity Hall, Cambridge; the Grand in 1886 and the Stewards’ in 1887. He was also in the winning 1887 Boat Race crew. One of these participants in the 2019 Boat Races is James Cracknell. The other 35 are not. Boat Race day 2019 bought Fleet Street’s picnickers parachuting down on Putney in pursuit of hacks’ bread and butter, the ‘great story’. 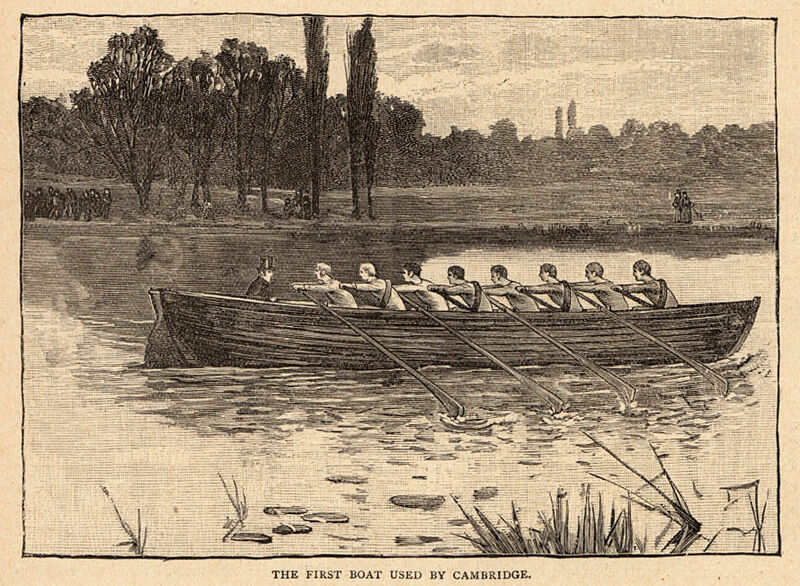 Not only was there an Olympic champion in the Cambridge boat, a long-in-the-tooth one at the age of 46, but he had qualified for his number 2 seat on merit. 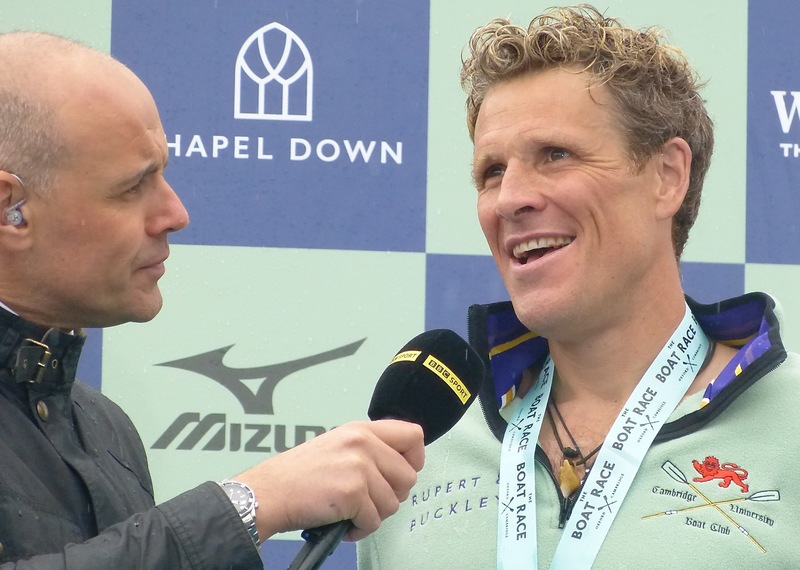 James Cracknell, gold medallist in Britain’s four at Sydney in 2000 and Athens in 2004, tried his best to keep a low profile among the Light Blues in the weeks before the race, but inevitably hogged the headlines on the day, helping Cambridge to a fine victory and clearing space for feature writers who are only seen at rowing events when the word ‘Olympic’ is on the card. James’s rowing record, Boat Race feat, post-Olympic fitness, cross-continental ventures, brain-damaging biking accident, marital breakdown, single-mindedness, bloody-mindedness, humour and winning smile earned plenty of column inches, but as Richard Williams pointed out in a measured piece in the Guardian, no other oarsman in the boat, or aboard the gutsy Oxford crew, was mentioned by name. 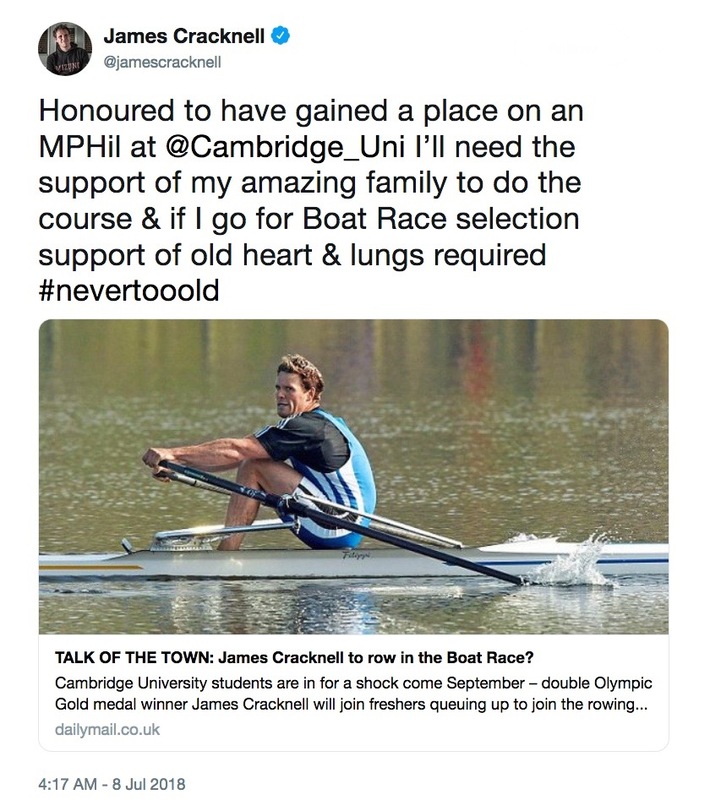 James Edward Cracknell, OBE. Other rowers are available. The Boat Race’s factory setting? Cambridge, 1829. The trouble with the factory setting for the Blues is that there were no Olympic Games, World Championships, international graduate study programmes or full-time athletes when it was set in 1829. The presence, nay aura of Cracknell (whose own journalism began with his entertaining “Bladerunner” columns in Regatta magazine) brought old arguments about graduates, ringers, internationals and foreigners once more to the fore. Briefly, the status rule used to say that participants must be full-time resident students, but it has never specified undergrads – nor, I believe, has any other student sport in Britain. Foreign students began to appear in the Boat Race in the 19th century, in the days before carrying a passport was necessary. When international rowing came along, the Boat Race became a nursery for aspirants to represent their country. As for ringers, men admitted to less than challenging courses of study, they are a thing of the past. The Oxford Crew of 1861. 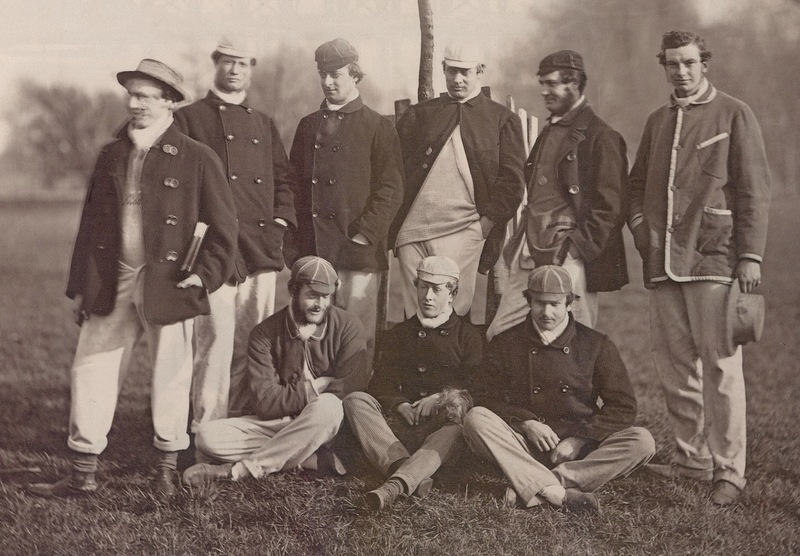 Standing second from the left is William Robertson, an Australian and the first foreigner to row in the Boat Race. At the time, however, a colonial was not necessarily thought of as foreign, so perhaps it was an American in Cambridge’s 1873 Blue Boat, JE Peabody, who was the first non-Brit. What has changed is the stream of foreign internationals reading for further degrees who finish their serious rowing at Oxbridge. 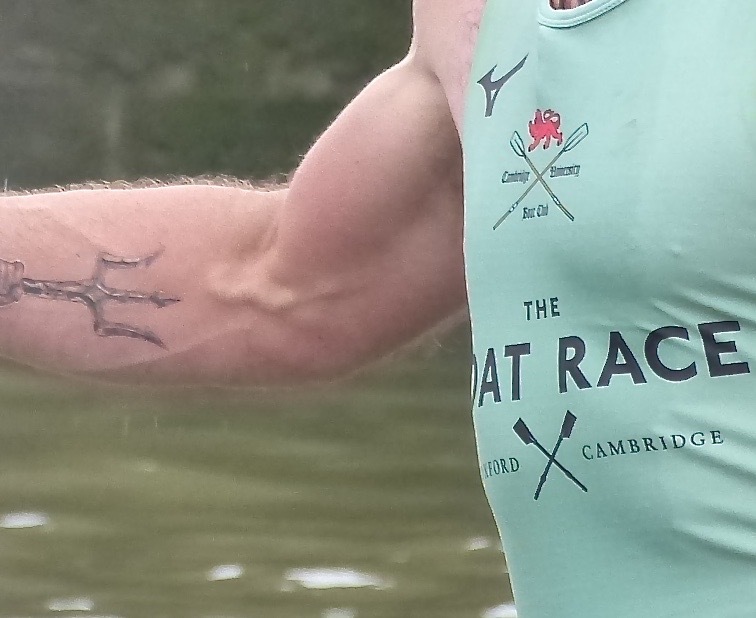 But hey, rowing’s a brainy sport. 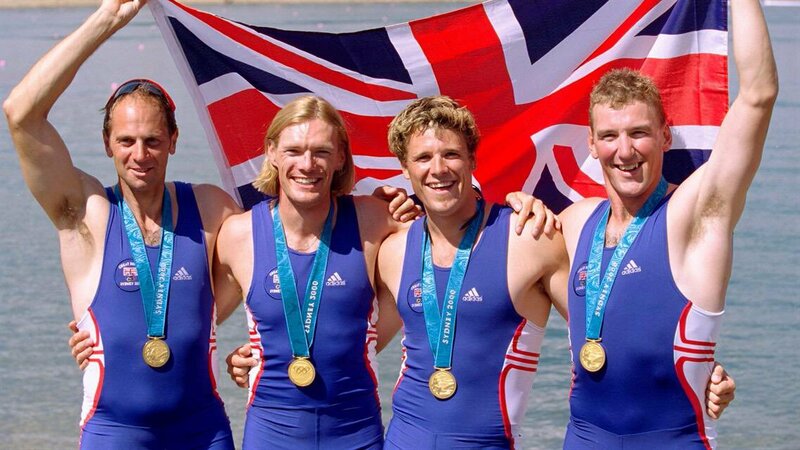 For what it’s worth, 20 of the 22 Brits who rowed to Olympic gold between 1984 and 2004 have at least one university degree, and one of the remaining two is an Hon. D Litt. Also, apropos of nothing, 11 of 19 British Olympic gold medallists coached personally by Jurgen Grobler have rowed in the Boat Race. All but Cracknell did so before Olympic achievement, although one of Sir Matthew Pinsent’s three Boat Races was after winning gold in Barcelona. The relationship between Blues and the GB squad is sometimes tense, particularly since the former GB Performance Director Sir David Tanner insisted that Olympic aspirants avoid the Boat Race during the two years leading up to the games. But the annual battle of the Blues remains an important feeder for Britain’s national team, whether undergraduate or graduate in nature. Some years ago, the journalist Rachel Quarrell and I addressed the undergraduate question in Rowing Voice. Our findings were interesting. Both Oxford and Cambridge had more than doubled in size since the 1960s, but the increase in numbers consisted almost entirely of female students and research programmes for higher degrees. As colleges went co-ed and gender equality advanced, numbers of male undergrads from which to draw oarsmen hardly increased. This has not been so much of a loss to the men’s race as a gain for the women’s. And on another note, there was a small printing error in the programme. The fastest men’s crew to the Mile Post, 3.31, was set by Cambridge in 1993, not 1998. (Error spotted by Barry Davies, the BBC World BR commentator). 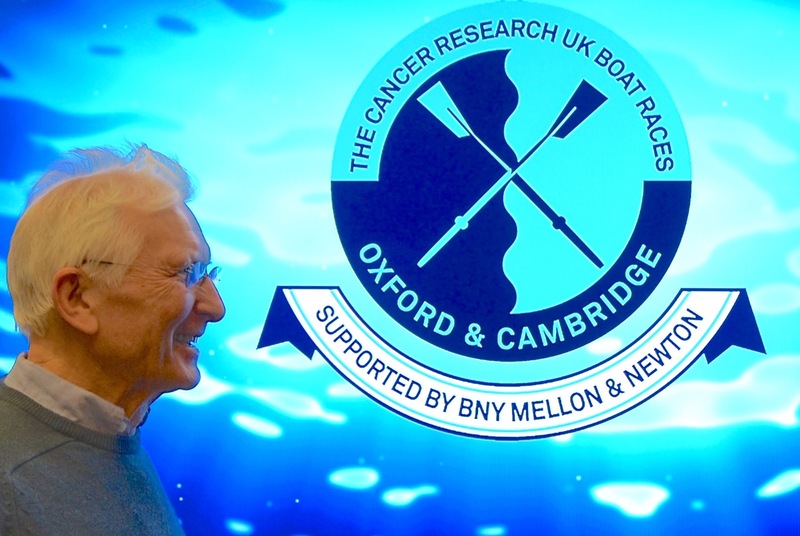 We can’t tolerate distortion of the Boat Race’s statistical record, can we? By the way, it was nice to see Oxford’s women’s Blue Boat shake hands from bow to stern while attached to the stakeboat. The Lord’s Crew in a copy of the 1829 Oxford Boat returning after the 2016 Parliamentary Boat Race. The 2006 Redgrave-Pinsent Rowing Lake and Sherriff Boathouse at Caversham (a suburb of Reading) may lack some of the grandeur of the Palace of Westminster. 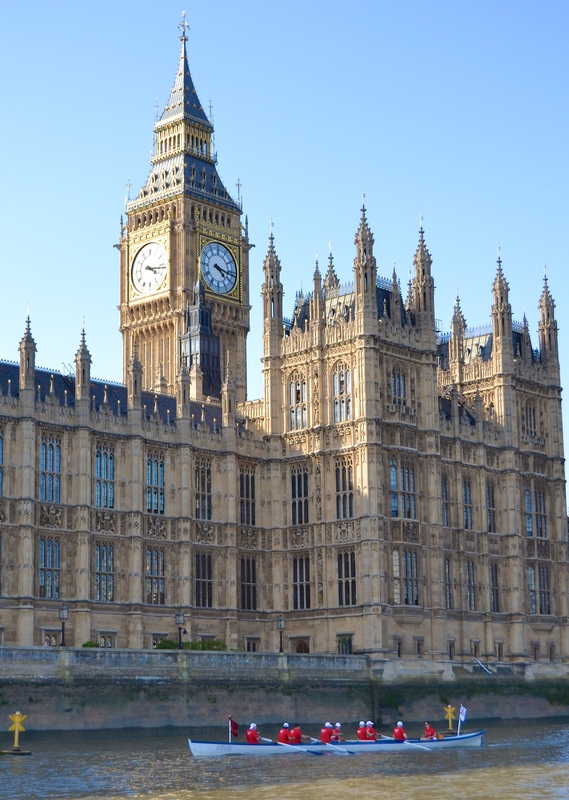 At a recent meeting of the Parliamentary Rowing Group, a revival of the Commons versus Lords regatta was announced for 5 September at GB Rowing’s Caversham HQ. You can tell how behind the times are Britain’s elected and unelected lifers and hereditary members whose bums occupy seats in the Palace of Westminster when you hear it suggested that sliding seats would be desirable for the fixture. Some also speculated on where Caversham was situated. It was thought to be en route to Wales. The discussion veered alarmingly towards morphing into a metaphor for the so-called B-word debate currently gripping Britain. Illustrations and captions provided by Tim Koch.